Are you familiar with Woo Wai Leong – the first winner of MasterChef Asia in 2015? Well, we daresay the bespectacled lawyer and home cook is now a fully-skilled chef with the opening of his new Restaurant Ibid. Located along North Canal Road, the restaurant is outfitted with little Chinoiserie design elements, such as modern woodencupboards concealed as traditional Chinese medicinal drawers, that mirror its East-West culinary direction of Nanyang or to put simply, contemporary Chinese food. Stemming from Chef Woo’s own heritage, dishes offered are reimagined Chinese oldies in polished forms. Case in point: Chef has zhng-ed the tea egg by presenting a single sous vide yolk on a bed of pureed onion, before dousing its entirety in broth brewed from pu’er tea leaves and aged Mandarin orange peels. 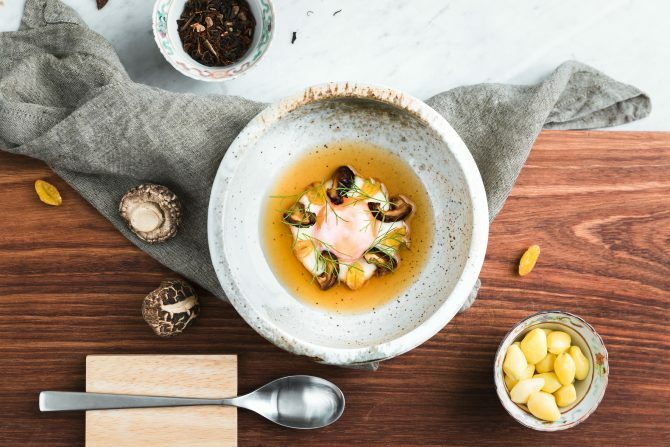 To go along with your tasting menu (from $78 for four courses), look to the Chef Woo again as he has stocked up wines that he personally curates himself.